This article contains the coming of the Roman Lakes as described by John Hearle in Mellor Through the Ages, with additions from Rachel Sewart’s article on the history of the Lakes in The Stockport Heritage Magazine of spring 2010. Rachel was advised on the history of the Lakes by Ann & John Hearle. On the 1st July 1865 railway line from Compstall to Marple and New Mills was opened. Various engineering problems had delayed the construction. “Marple Station was greatly thronged on Good Friday…between two and three thousand visited the place by ordinary and special train”. 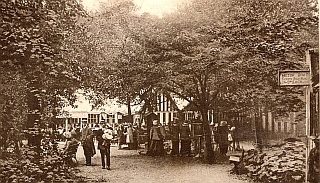 Pubs arranged popular attractions, tea-shops opened and cottagers sold pots of tea at their front doors, farmers opened their fields for picnics. 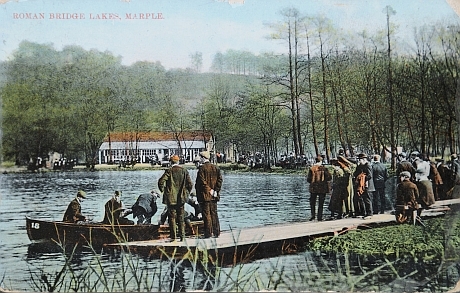 On a Saturday in June 1896, 3000 visitors came from Oldham alone and, according to a newspaper report,more than 20,000 people visited Marple Bridge on Good Friday,1933. 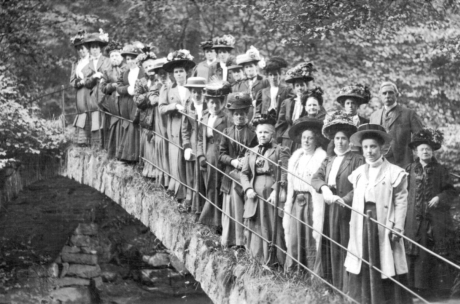 The destruction of Mellor Mill had led to the biggest attraction. At Christmas 1892, Edwin Furness, who had been manager of the mill, sat in the parlour of his home at Strawberry Hill,with his brother, who was Chairman of Ardwick AFC, which had that year become a founder member of the Football League and two years later would become Manchester City. So the Roman Lakes Leisure Park was born and the old packhorse bridge across the Goyt became the Roman Bridge. The Park prospered. In 1867 the estate was up for sale, by the Arkwright family. This did not succeed. The Furniss family,acting as agents for the Arkwrights, first leased and then purchased the grounds and established the Roman Lakes Company Ltd. People headed for the Roman Lakes to listen to the band, join the dance, row on the lake and play on the slot machines. In winter with the water level lowered, ice skating could be enjoyed on those freezing days. By the end of the 1930’ s, as buses and cars made it easier to go further into the countryside and cinemas provided entertainment in the towns, the popularity declined, but revived during the Second World War when cars were deprived of petrol. 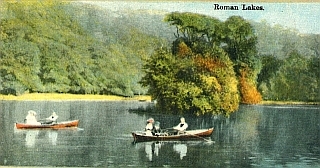 Boating reached a high point of 68 rowing and motor boats, but its demise was caused by the conflict of the needs of anglers, enjoying the enrichment of the lakes waters by coarse fish, and the oarsmen.The decision made led to the end of an era of summer boat trips. Bands, dancing and slot machines have gone but the present owners, the Sewarts, continue to run the Leisure Park, with an income from fishing and sale of refreshments and a welcome for walkers and cyclists. In the early days of their ownership, in the first years of the 1950’s, the site was a prime destination for vandals and thieves, with the latter’s targets being the penny slot machines and stocks of tobacco and cigarettes. Sydney Sewart, Bernard Sewart’s father, finally resorted to sleeping onsite, despite his early 4am opening time. With the strong support of Bernard Sewart as chairman and Rachel as secretary, the newly formed Friends of our Valley are enhancing the opportunities to enjoy the beauty of this section of the River Goyt and its wildlife.